Journey diamond rings are beautiful, symbolic pieces that show the progression of a couple's relationship. A classic diamond journey band has graduated stone sizes in a line to show the growth of a couple's love, and how the love will continue. However, there are many other styles to choose from, including three stone settings, or graduated settings that culminate in the middle symbolizing two lives coming together. Click on the 'buy now' link for purchasing information on the following rings. A classic journey band in gold makes an ideal wedding band or anniversary gift. It's simplistic elegance draws attention to the symbolism in the band. Journey diamonds lined along one side of a heart is a romantic choice for a sentimental ring. The largest stone could be either at the center or the outer point of the heart. Most journey diamond rings are swooped or curved to show the twists and turns a relationship can take, but a straight line of graduated diamonds is an equally symbolic and unique option. If the ring will be worn as part of a wedding or anniversary set, the metal of the band should be as thick as the widest stone to ensure there are no gaps between adjacent rings. An eternity ring with journey set diamonds is a beautiful and symbolic ring. Journey diamonds are set on top of an infinity ring to create this special piece of fusion jewelry. While a diamond journey ring may be the most traditional, a gemstone variation can be even more lovely. Purple amethysts, set in a vertical pattern against sterling silver bands, makes this an ideal choice for an anniversary ring or promise ring. Different hues of color add to the ring's symbolism. Round diamonds are the most common for journey rings, but emerald, princess, and baguette shapes are also lovely choices. 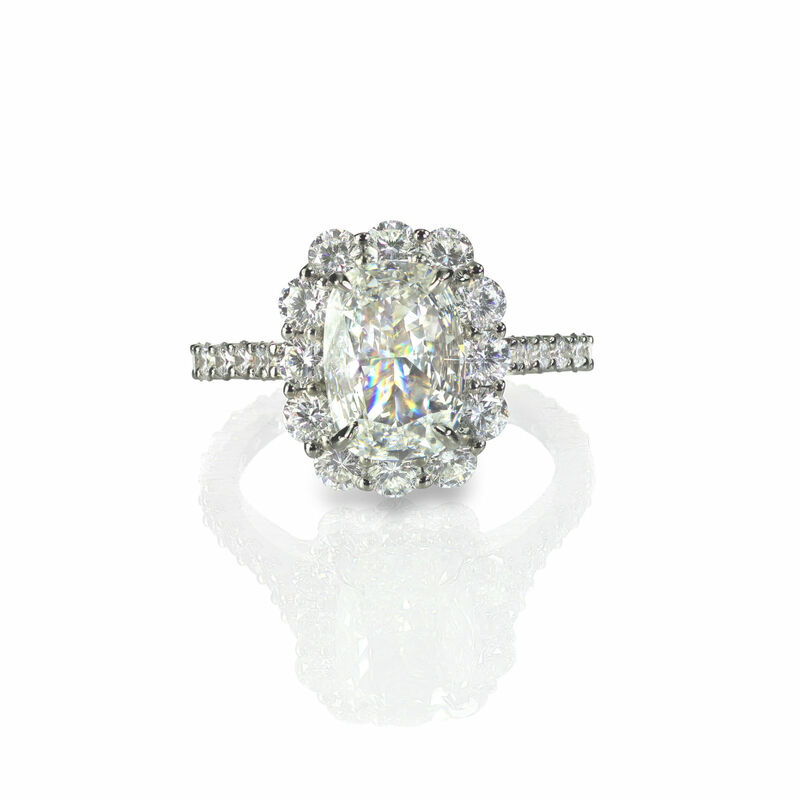 A designer diamond ring may even use more than one stone shape for an elegant and sophisticated contrast. Gemstones, combined with small diamond accents make a lovely and symbolic ring. Cubic zirconia may also be used for a more affordable ring design. Three stone diamond rings are a simple type of journey ring that represent a couple's past, present, and future together. Three stone engagement rings are particularly popular when a couple's journey is just beginning. Small pave or channel set diamonds leading to the three diamond set in the middle, adds symbolism to the ring. Unique journey ring designs may include unusual designs such as bezel settings, steep curves, curved or tapered bands, and infinity splits. When choosing a unique design, however, it is best to consider it as a right hand ring rather than part of a set, since unique ring shapes may not fit smoothly against an existing engagement or wedding ring. A colorful journey ring feature out-of-the ordinary stones such as black diamonds, can symbolize the special bond that the two of you share as you grow on your journey together.